Home / Blog / The Importance of Dietary Fibre and How to Increase Your Intake! The Importance of Dietary Fibre and How to Increase Your Intake! Quite a few people don’t know the importance of dietary fibre. This is a problem in many countries where people do not consume nearly as much fibre as they should, as fibre is essential for healthy digestion. Dietary fibre has also been linked with improved colorectal health, blood glucose control, reduced chances of heart diseases and also aids in weight management! It takes much more time for your body to digest fibre when compared to simple carbohydrates, thus you end up feeling more energized and fuller for longer- being able to complete tasks without worrying about snacking every 10 minutes! Knowing that, surely more people would aim to consume sufficient amounts of Fibre on a daily basis! In the UK, the recommended dietary fibre intake is 30 g/day for adults! Some people may find this to be an easily achievable goal on a daily basis, however for those who are not used to choosing whole grains, vegetables and natural, whole foods- this daily recommendation can be daunting! However, don’t fear! There are some easy ways to increase your fibre intake by changing up a few habits and today we are sharing some of them with all of you! Choose a high-fibre breakfast (porridge, whole grain toast, bran flakes) to start your day right! Wholegrain is better than wholemeal, and MUCH better than white bread or pasta! Mix up your carbohydrate intake to consist of other wholegrains like brown rice, quinoa, bulghur wheat or barley. Eat your 5 a day or more! Don’t skip out on the vegetables. Choose smoothies instead of juices as smoothies still have fibre in them, while juices are pure liquid and sugar- no fibre. Top smoothies or smoothie bowls with Chia seeds, cacao nibs or barley grass powder! 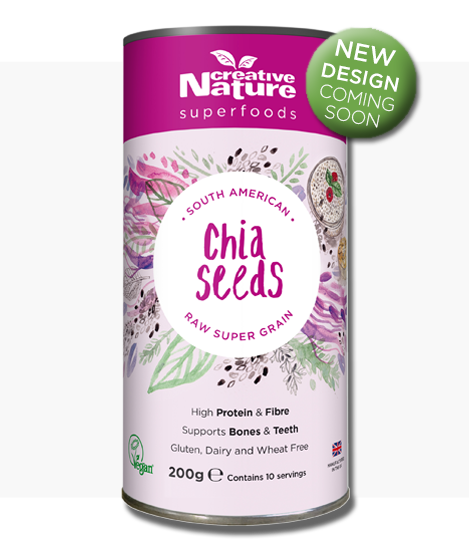 Mix in nuts, Creative Nature Chia seeds or shelled hemp in with salads for additional fibre as well as a crunchy texture. Choose raw, wholefoods rather than processed foods. Eat potatoes with skins- more filling, more texture and even more fibre!